Data Loss is THE BIGGEST issue for computer and smartphone users across the globe. Data Loss is actually the loss of information stored in a data storage device due to negligence, failure of the device, etc. According to a report in 2012, about 94% of computer users are always at risk of Data Loss. Previously there was no convenient way available to clone or make a backup of data but now there are various options for data storage provided by numerous companies. We have tested few services which helps in Cloning of the entire system, and have found EaseUs Todo Back Free as one of the cheapest & reliable data cloning and recovery software. 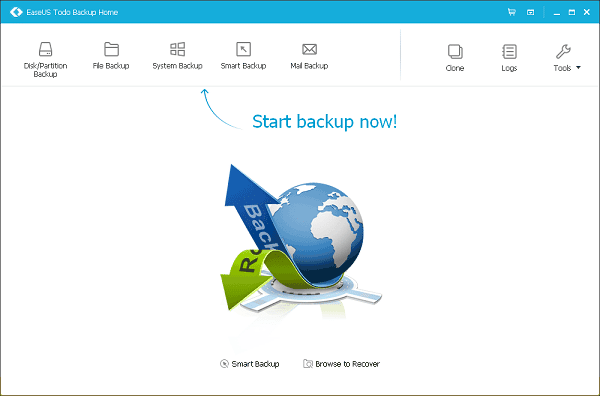 There are several benefits of EaseUS TODO Backup like easy to install, fast, safe & easy backup process, 256 bit AES encryption, splitting backups, cloning of the hard disk, Sector-by-sector backup, multi-language support etc. EaseUS Todo Backup options include entire system backup, disk imaging, selective file backup, hot backup of files already in use, outlook backup, updates to last backup, etc. System backup clones entire Operation System and helps in recovery in times of data loss or system failure. The backup management software provided with Todo Backup helps in Viewing and modifying old backups to free up space by deleting outdated backup files. It also helps in compressing the backups to reduce the space consumed by the backups. The 256 bit AES encryption algorithm (having the same key to encrypt & decrypt the data) ensures advanced level security for your data. Apart from technical support they are providing various guides to help you understand How to clone hard drive, how to perform windows 10 backup, etc. There is no special requirement to run EaseUs Todo Backup software. Just install and you are ready to go. The Home version of Todo Backup is compatible with Windows XP, 7, 8, 8.1 and Windows 10. EaseUS Todo Backup has 3 versions viz-a-viz Todo Backup Free, Todo Backup Home & Todo Backup Workstation. The Free version has basic backup & restore feature, provides cloud backup functionality, full/incremental or scheduled backup, hard disk partition, cloning, etc. The Home Version provides outlook backup, enhanced speed, technical support, etc as added functionality. Checkout all the versions here. I tried to perform Windows 10 system & data backup using Easeus Todo Backup Free version. I will recommend backing up only data & skip OS & other software which can be installed from other original discs. This will help in reducing the backup time and space required. For upgrading or switching the hard disk, Full Disk Image Backup will be the best solution. Next articleWhy the high-price tags for Xperia X & XA again?